Captures the component implementing a rule. Defines the Principles framed and followed in the enterprise. Tag Value Type = Enterprise / Business / System / Application / Technology / Data. Defines the Standards followed in the enterprise. Captures the assumptions made in information manipulation. 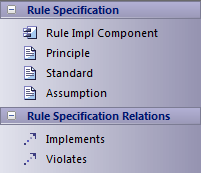 Indicates that a Rule Impl Component implements a rule. Indicates that the rule is violated by the connecting model element.